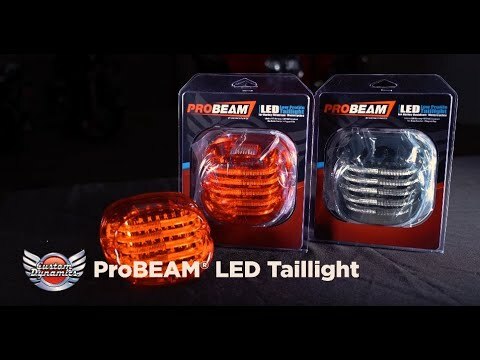 ProBEAM® LED Taillights have been engineered from the ground up using the highest quality automotive LEDs and modern light pipe design! Custom Dynamics® premium line of aftermarket LED taillights now provides increased side visibility to maximize safety through modern technology for Harley-Davidson® motorcycles. 5 light pipes illuminate across the taillight as the constant on running light, while 25 separate LEDs provide a full contrast brake light. The Low-Profile design protrudes only two inches from the stock taillight baseplate for a sleek custom look on your rear fender. Available in Red (ECE Compliant) or Smoke, with or without top license plate illumination window. Replacement gasket and nylon washers included for plug and play installation. Lifetime warranty against LED failure. 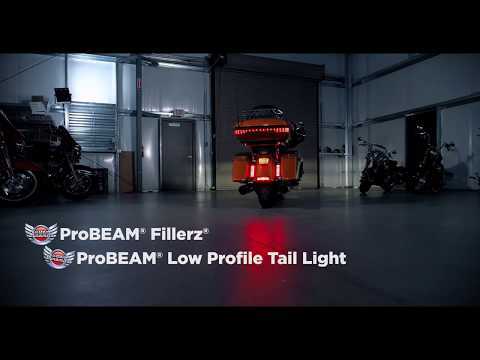 Simple plug and play installation for most 1999-2019 Harley-Davidson® models (including TriGlide) equipped with a OEM Squareback Taillight (68245-03). Custom Dynamics® recommends all 2001-2002 CVO Dyna Wide Glide, 1999-2008 Dyna Wide Glide (FXDWG), 2008-2013 Dyna Fat Bob (FXDF), 1999-2009 Softail Night Train (FXSTB), 2008-2011 Softail Cross Bones (FLSTSB), 1999-2010 Softail Custom (FXSTC), 1999-2007 Softail Standard (FXST), 1999-2006 Springer Softail (FXSTS), 2015-2019 Freewheeler, 2009-2012 XR1200 & XR1200X use Custom Dynamics® Squareback style taillight as models with a “bobbed” style fender require the taillight to mount inverted. Use in conjunction with Custom Dynamics® Magic Strobes™ Brake Light Flasher module to add full contrast brake flash or strobe patterns for even more visibility!